Australia's new prime minister began his first full day Saturday with a phone call to Donald Trump as he set about restoring faith in his "battered and bruised" government after a tumultuous week. 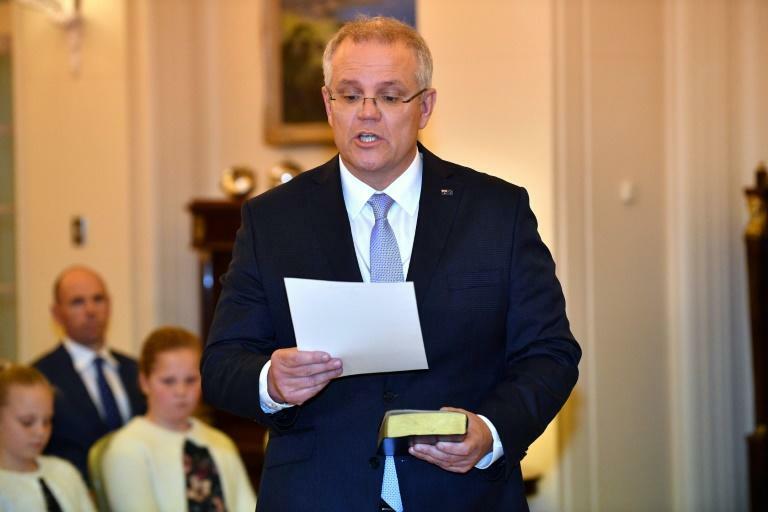 Scott Morrison was sworn in as the country's 30th leader late Friday after a bitter Liberal Party revolt against moderate Malcolm Turnbull driven by a hardline conservative faction. The former treasurer, a Turnbull ally who upset right-wing challenger Peter Dutton in the internal party ballot, said he had had a warm chat with the US president. "Had a great discussion with @realDonaldTrump this morning," he tweeted. "We affirmed the strength of the relationship between the US and Australia." Allen famously carried to safety 12 wounded Americans during an attack on Japanese positions at Mount Tambu in New Guinea during World War II in 1943. "President Donald J. Trump spoke last night with Prime Minister Scott Morrison of Australia and congratulated him on his recent election," the White House confirmed in a readout of the call Saturday. "The two leaders underscored the importance of the bilateral partnership between the United States and Australia. They also pledged to continue to closely cooperate on priorities the two countries share," it added. Trump also took to Twitter to congratulate Morrison on Friday. "There are no greater friends than the United States and Australia," he said. With their pleasantries out the way, Morrison began work on nailing down a ministerial frontbench after a series of resignations as he looked to put a torrid week of political manoeuvring behind him. "There's a lot to do today, so I'm looking forward to getting there and making sure we get everything in place that we need to," he told Channel Nine television. "The stability of government -- that continues, and I'll be meeting with some colleagues today as we pull the ministry [cabinet] together and make some announcements about that over the weekend." Turnbull blamed Dutton, former leader Tony Abbott and other Liberal "insurgents" for destabilising the party in their challenge to his leadership and Morrison must decide whether they should return to the frontbench. The internal bickering infuriated many inside the Liberal party and renewed public disgust towards the political class. Morrison, an evangelical Christian known as "ScoMo", admitted the government had been "battered and bruised" by the turmoil and has vowed to get the focus back on the Australian people. He said his top priority was to help farmers in New South Wales state struggling through one of the worst droughts in half a century. With the government lagging in opinion polls and national elections due by the middle of next year, Morrison also has his work cut out fending off a resurgent Labor opposition. "The voters of Australia are telling me loud and clear that the last week in politics has probably been the biggest farcical week ever in Australian history," Labor leader Bill Shorten said on Saturday. "It's a different leader, but it's the same chaos and division."